This article is about the southwest Virginia city of Bristol. For the northern Virginia town of Bristow, see Bristow, Virginia. According to the United States Census Bureau, the city has a total area of 13.2 square miles (34.1 km2), of which 13.0 square miles (33.7 km2) is land and 0.15 square miles (0.4 km2), or 1.07%, is water. Little Creek and Beaver Creek flow south through the city; Little Creek flows into Beaver Creek two blocks south of the state line in Tennessee. Beaver Creek is a tributary of the South Fork Holston River. The city is served by Interstates 81 and 381, and by U.S. Routes 11, 19, 58, and 421. I-81 leads northeast 149 miles (240 km) to Roanoke, Virginia, and southwest 113 miles (182 km) to Knoxville, Tennessee. Interstate 381 (I-381) is a spur from Interstate 81 that provides access to Bristol, Virginia, United States. It runs for 1.7 miles (2.7 km) from the intersection of Commonwealth Avenue (State Route 381) and Keys/Church Streets in Bristol at exit 0 north to Interstate 81. The I-81 interchange, the only one on I-381, is signed as exits 1A (I-81 north) and 1B (I-81 south). US 11 and US 19, running parallel to I-81, lead northeast 15 miles (24 km) to Abingdon, Virginia. US 11 splits into routes 11W and 11E in Bristol; US 11W leads west-southwest 23 miles (37 km) to Kingsport, Tennessee, while US 11E and US 19 lead south-southwest 25 miles (40 km) to Johnson City, Tennessee. US 58 runs with I-81 northeast for 17 miles (27 km) before splitting off to the east just beyond Abingdon; US 58 and 421 together lead west 27 miles (43 km) to Weber City, Virginia. US 421 leads southeast 33 miles (53 km) to Mountain City, Tennessee. As of the census of 2000, there were 17,367 people, 7,678 households, and 4,798 families residing in the city. The population density was 1,346.4 people per square mile (519.8/km²). There were 8,469 housing units at an average density of 656.6 per square mile (253.5/km²). The racial makeup of the city was 92.54% White, 5.57% Black or African American, 0.25% Native American, 0.37% Asian, 0.01% Pacific Islander, 0.18% from other races, and 1.08% from two or more races. 0.97% of the population were Hispanic or Latino of any race. There were 7,678 households out of which 24.8% had children under the age of 18 living with them, 46.1% were married couples living together, 13.6% had a female householder with no husband present, and 37.5% were non-families. 34.3% of all households were made up of individuals and 17.4% had someone living alone who was 65 years of age or older. The average household size was 2.18 and the average family size was 2.78. In the city, the population was spread out with 20.3% under the age of 18, 8.6% from 18 to 24, 26.2% from 25 to 44, 24.4% from 45 to 64, and 20.5% who were 65 years of age or older. The median age was 41 years. For every 100 females, there were 82.0 males. For every 100 females age 18 and over, there were 75.9 males. The median income for a household in the city was $27,389, and the median income for a family was $34,266. Males had a median income of $28,420 versus $20,967 for females. The per capita income for the city was $17,311. About 13.2% of families and 16.2% of the population were below the poverty line, including 25.8% of those under age 18 and 12.4% of those age 65 or over. The city of Bristol, Virginia, is served by two law enforcement agencies: the City Police and the City Sheriff's Department. The Bristol, Virginia Police Department is a full service law enforcement agency providing police field services 24 hours a day. The department has 53 sworn police officer positions, and a non-sworn support staff of 21 full-time members for a total of 74 members. Included in the support staff is the city's E-911 Central Dispatch Emergency Communication Center which provides call taking and dispatch service for police, fire and EMS needs. Despite its relatively small size, Bristol, Virginia, boasts one of the more advanced broadband networks in the country. 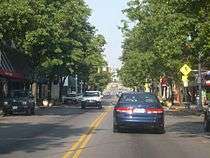 Bristol Virginia Utilities (BVU) started planning a fiber optic deployment in the city in the late 1990s. By 2001, BVU had been granted approval by the city council for a full deployment of a Fiber to the premises (FTTP or FTTU, fiber to the user) project. This project was to offer competition to local incumbents and provide broadband Internet, cable TV, and telephone service to the residents of Bristol. This deployment was one of the first of its kind in the United States and was widely watched by the telecommunications industry. A system known as Passive optical network (PON) was successfully deployed to over 6,000 customers in a matter of two years. In 2003, in the relatively isolated city of Bristol, Virginia, Bristol Virginia Utilities (BVU), created a nonprofit offshoot called "Optinet", a municipal broadband Internet service that covers Bristol as well as the Southwest portion of the state of Virginia. Serving around 12,500 customers, BVU is recognized as the "first municipal utility in the United States to deploy an all-fiber network offering the triple play of video, voice and data services". On October 29, 2009, BVU received USD 3.5 million in grant funding from the Virginia Tobacco Indemnification and Community Revitalization Commission. With these funds BVU will build "an additional 49 miles of its OptiNet fiber-optic backbone from Abingdon up I-81 to Virginia Route 16 from Marion into Grayson County". This will also allow for BVU to make a second connection with Mid Atlantic Broadband, increasing communication between different businesses in Northern Virginia. The Virginia Tobacco Community funded this project because it provided their business with more connections in crucial areas of the southwest and southern part of Virginia. The U.S. Department of Commerce also funded BVU. 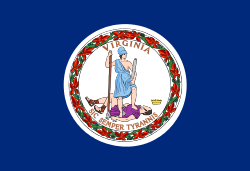 On July 3, 2010, it was reported that they gave USD 22.7 million in stimulus funds to Southwest Virginia to create a "388-mile optic backbone through an eight-county region". This project will service over 120 institutions, such as schools, hospitals, government buildings, and many more besides. This new municipals broadband service will also be within a two-mile distance of over 500 different businesses. This project also created 295 new jobs. BVU Optinet continues operate a strong municipal broadband Internet service for Bristol and many other counties in Virginia. Today, Bristol Virginia is still one of only a few FTTP deployments in the country with a significant number of customers online. Bristol's twin city in Tennessee is deploying an FTTP system similar to its neighbor across the state line. The Bristol Virginia School Division operates four pre-K/Kindergarten through 5th grade elementary schools. one grades 6-8 middle school, and a grades 9-12 comprehensive high school. All schools are fully accredited by the Southern Association of Colleges and School. The division's annual budget (2011-2012) is $23,733,149 with a per pupil expenditure of $10,667. The full array of educational offerings is available at all levels, including special education, gifted education, and Tech Prep. Each elementary school has a networked computer lab which provides opportunities for individualized instruction and content enrichment. The Virginia Middle School offers French and Spanish as well as Algebra 1 and Geometry. Three computer labs are available. All schools have outstanding art and music classes taught by specialists. Virginia High School offers Advanced Placement classes in English, computer science, history, science, and math, Tech Prep classes, honors classes, as well as outstanding career and technical offerings, such as marketing, culinary arts, and criminal justice. More than 76% of the graduates continue their education in a two or four-year colleges. Class sizes average approximately 18 students at the elementary level, 15 at the middle school level, and 17 at the high school level. More than 200 educators including classroom teachers, guidance counselors, special education teachers, librarians, and other specialists provide the best possible education for each child. Nearly 50 percent of the certificated staff have earned master's degrees and the average Bristol Virginia teacher has more than 16.8 years of classroom experience. Bristol was recognized as the "Birthplace of Country Music", according to a resolution passed by the US Congress in 1998; residents of the city had contributed to early country music recordings and influence, and the Birthplace of Country Music Museum is located in Bristol. In 1927 record producer Ralph Peer of Victor Records began recording local musicians in Bristol to attempt to capture the local sound of traditional "folk" music of the region. One of these local sounds was created by the Carter Family. The Carter Family got their start on July 31, 1927, when A.P. Carter and his family journeyed from Maces Spring, Virginia, to Bristol, Tennessee, to audition for Peer who was seeking new talent for the relatively embryonic recording industry. They received $50 for each song they recorded. Since 1994, the Birthplace of Country Music Alliance has promoted the city as a destination to learn about the history of the region and its role in the creation of an entire music genre. The Alliance is organizing the building of a new Cultural Heritage Center to help educate the public about the history of country music in the region. Bristol hosts the Bristol Pirates baseball team of the Appalachian League. Former NASCAR driver Kelly Denton is from the city. On the Tennessee side, Bristol is home to Bristol Motor Speedway, the "world's fastest half mile", which hosts two races per year on the NASCAR Sprint Cup circuit, two races per year on the NASCAR Xfinity Series circuit, one race per year on the Camping World Truck Series circuit, and various other racing events. The complex includes the Bristol Dragway, nicknamed "Thunder Valley", referencing the hills that echo the engine noise back toward the crowd. 1 2 "State & County QuickFacts". United States Census Bureau. Retrieved January 5, 2014. ↑ "Geographic Identifiers: 2010 Demographic Profile Data (G001): Bristol city, Virginia". U.S. Census Bureau, American Factfinder. Retrieved August 20, 2015. ↑ "U.S. Decennial Census". United States Census Bureau. Archived from the original on May 11, 2015. Retrieved January 5, 2014. ↑ "Historical Census Browser". University of Virginia Library. Retrieved January 5, 2014. ↑ "Population of Counties by Decennial Census: 1900 to 1990". United States Census Bureau. Retrieved January 5, 2014. ↑ "Census 2000 PHC-T-4. Ranking Tables for Counties: 1990 and 2000" (PDF). United States Census Bureau. Retrieved January 5, 2014. ↑ "Brillhart named Bristol, Virginia mayor". HeraldCourier.com. Retrieved 5 December 2015. ↑ "Broadband at the Speed of Light". Institute for Local Self-Reliance. 9 April 2012. Retrieved 4 December 2015. 1 2 "Bristol Virginia utilities: about us". 1 2 "Bristol Virginia Utilities receives $3.5 million for broadband construction". www.lightwaveonline.com. Retrieved 2016-02-29. 1 2 3 Telegraph, CHARLES OWENSBluefield Daily. "Stimulus funding to stretch broadband through 8 Va. counties". Bluefield Daily Telegraph. Retrieved 2016-02-29. ↑ Phillips, V.N. (Bud) (2006). 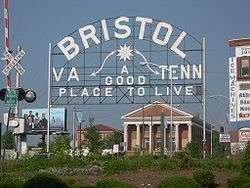 A good place to live : Bristol, Tennessee/Virginia. Johnson City, Tenn.: Overmountain Press. p. 211. ISBN 9781570723148. Retrieved 14 June 2016. ↑ "Birthplace of Country Music". Retrieved 16 April 2015.